Fixed rip details – www.muien.nl De Nederlandse website over muien. The Dutch website about RIPS. Let us look more in detail to the fixed rip.The rips located in the sandbars can be split up in 3 different parts. See the sketch. Waves coming out of the sea are breaking in the surfzone. See the light blue arrows on the yellow sandbar. The consequence of this is that at the beachside of the sandbar in the trough the waterlevel will rise. (A) In the sandbar at B-B there is a channel or a deeper part of the sandbar. In this area (B-B) no or less breaking waves will cause no or less increase of the waterlevel in the trough compared with A. Water will flow from high level to low level. This is why you see a current at A flowing from A to B-B. This current is called the feeder. Sometimes they call it long-shore current but that is not the same. In the sketch you see 2 feeder currents A. However, most of the time there is only 1 feeder current. Depending on the level difference between A and B-B, the water level at B-B wil increase also causing a current in the rip channel B-B to C. B-B is called the neck of the rip. 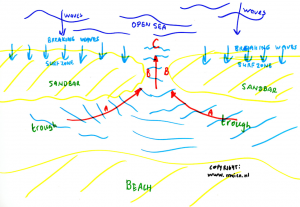 The current from B will end in open water is slowing down at C. C is called the head of the rip. Current A is visible most of the time, B is difficult to spot with higher waves and C is not always there. In the next chapters the 3 parts will be discussed in more detail. Go on now to feeder current (A).